Diesel Generator. We launched our first range of 1500 RPM generator. In collaboration and with the experience of one of the world’s leading manufacturers in this product category, we launched our firts range of 1500RPM diesel generator. Initially the range in permanent stock is composed of 3 models of 14, 20 and 27kVAs and optionally ATS control box. Its affordable price and easy installation make of them an excellent choice for auxiliary power in place where is recommended or required a auto start generator for the grid failure. Other solutions and powers output could be produced according the need of customer within approximately 60 to 120 days depending on the engine and desired characteristics. 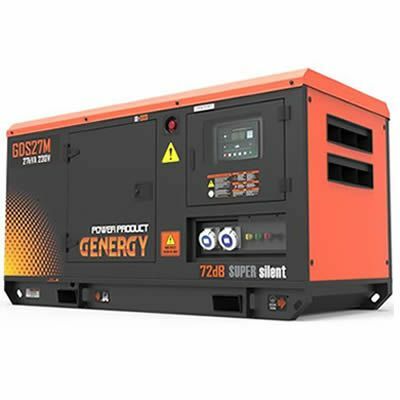 Most of the generators for sale are gas powered generators, running on plain old unleaded but we do have a selection of diesel generators for sale also which comes with the usual gas vs diesel pro’s and cons. Diesel generators are more fuel efficient and easier to maintain because of less parts (carburettor, spark plugs, etc.) and less heat generated but are noisier and cost more to buy generally. Never connect a generator directly to household wiring. A transfer switch must be used to supply generator power through a household circuit. It must be installed by a licensed electrician and approved by your local utility. Opening the main breaker to isolate household wiring from the utility’s wires is neither legal nor safe. The household breaker does not provide a sufficient gap to ensure isolation of the energy, and the breaker may have been damaged as a result of the outage, creating a dangerous hazard that could cause a fire or electrocution. Connecting a generator directly to household wiring without a transfer switch may create backfeed (electrical energy from the house to utility wires), creating severe risk for electrical crews. If the utility wires are re-energized while a generator is connected via house wiring, the generator also could explode and catch fire. Liability for any injury or death resulting from an unauthorized connection would rest with the person who connected the generator. The safest way to use a portable generator is to connect the generator directly to the load(s) being served. Some users wish to power only their refrigerator and a few lights, while others are primarily concerned with running the fan on a gas or oil-fired furnace. An extension cord from the generator to the needed appliances or fixtures is the most effective method. In the case of a furnace, most furnace fuel suppliers can provide a connection that makes use with a generator fairly simple. The generator should be rated to produce the amount of power necessary for the appliances or fixtures selected. In the case of a refrigerator or fan, this should be the starting wattage, since the power required to start an electric motor is higher than the power used once it is running. For example, if you want to power two 60-watt lights and a 750-watt refrigerator, you would most likely select a 1000-watt generator. A portable generator uses an internal combustion engine which emits carbon monoxide, so it must be well-ventilated. Be sure to place the generator where exhaust fumes will not enter the house. Consider the fuel capacity of the generator if you want to keep a refrigerator running during the day while you are away from home. A wide variety of size and quality of diesel generators is available in the marketplace. There are small units that will handle a single light and a radio. There are also large units that, used with a transfer switch, can be started remotely and power half the circuits in a large home. The size you choose is determined by what you want to power and by your budget. Diesel engines are designed to operate with a load. When a diesel engine operates considerably below the rated output level the engine can start to over-fuel or “Wet Stack”. Diesel engines perform most efficiently in the 70-80% range of rated output. When an engine operates for a prolonged period of time below 40% of the rated output it begins to over-fuel. This occurs because the injection tips began to carbonize and disrupt the fuel spray pattern. In commercial generator standby/emergency systems where loads can vary and low output conditions can occur more frequently because of the diverse load applications, an automatic load bank is normally used. A load bank will place a “false” load on the generator system to keep the diesel engine properly loaded to prevent a “Wet Stack” condition. In residential or small business applications a “false” anti-wet stack load condition can be accomplished with the use of an electric heater or other high load appliance to make sure the diesel engine generator system is not allowed to operate for prolonged periods of time below an acceptable level. Once a diesel engine begins to “wet stack” the only way to correct the problem is to load the engine for a couple of hours to burn off the excess fuel and clean up the engine. Some diesel engines are less prone to “wet stacking” than others. Generally, electronically controlled engines and engines with advanced emission systems are less likely to “wet stack”. Unfortunately, all diesel engines will “wet stack” if operated for long periods of time considerably below the rated output level. It is for this reason that proper sizing and design is important. We can help you with all your sizing and design considerations.